From this article you will learn why multiple copies of the same message may appear, and how to find & remove duplicate emails in Outlook quickly and safely, ensuring that all of your important messages remain intact. But to be honest, I've never met a person like that. 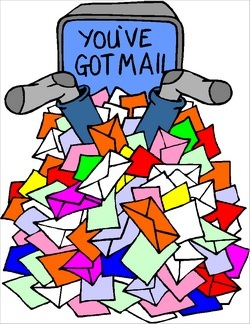 It's estimated that an average Outlook user receives around 50 - 100 messages a day. So, usually we have thousands and thousands of emails stuck in various folders and you may not even have a vague idea of how many duplicated emails actually are in your Outlook. Why do duplicate emails appear in Outlook? What problems can duplicate messages cause? How do I remove duplicate emails in my Outlook? There are plenty of causes why duplicate email messages may occur in Outlook. For example, you can receive multiples copies of the same email from your friends or teammates who forward to your attention the same newsletter, press release or an exciting news item, which is often the case in our company. Other reasons are more technical and not so obvious. An interrupted or incorrect synchronization with a laptop or mobile device is one of the most frequent causes, e.g. if you read some messages on the phone and others on your PC, and then place the read messages to a different folder on each device. Sometimes duplicate e-mails are produced by a hiccup of the mail server, especially if you activated the "Leave Messages on the Server" settings option. Incorrectly configured Outlook rules when two or more "move a copy to" rules apply to a certain incoming message also lead to email duplication. Merging several PST files into one may result in duplicated messages too. And even your antivirus software may create duplicate e-mails. Of course, it won't do this deliberately, it might be just an intermittent side-effect, especially if you click the "Send/Receive" button all too often interfering in the scheduled send/receive/store process. Whatever the reason is, multiple copies of the same message might cause great confusion and disorder in your Outlook, making your work more stressful and less productive. As you probably know, Outlook is one of the most complex and resource-hungry applications of the Microsoft Office suite. It requires quite a lot of resources for smooth performance, and the more email items you have, the more memory, disk space and CPU usage it consumes. Finally, it may reach the point when the existing resources do not suffice and your Outlook will start to slow down in performance. For example, you want to find a particular message using Outlook's Instant Search, but all that you see is "Searching…". And you have to wait patiently while Outlook iterates through all email messages in a given folder including duplicated ones. On an average PC, Outlook starts to slow down when the mailbox reaches 2-3 GB, and if you don't reduce the size of your mailbox and Outlook data file (.pst), your Outlook may start hanging, freezing and not responding. Unfortunately, even the latest version of Outlook 2013 does not provide any tool that would let us remove duplicate email messages in Outlook folders. Microsoft suggests a way, or rather a workaround, to delete duplicates manually. You can try it if you have time, and this may even work if you have a few dozen emails. This might be challenging if you have several hundred messages, and next to impossible if you have thousands… and absolutely impossible if those thousands are stored in different folders. So, how can you eliminate all duplicated emails from Outlook? There exist a number of different tools to eliminate dupes. Some of them are quick, simple and free. Others are more flexible and sophisticated but, as you may guess, paid. We will cover pros and cons of both types and you will decide which is right for you. 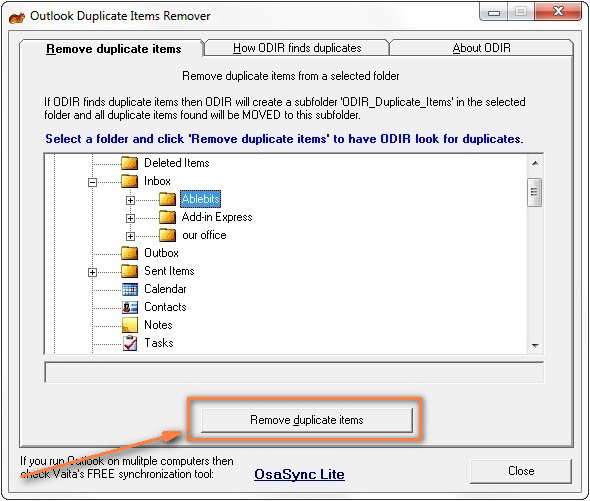 The most popular and time-tested free tool is Outlook Duplicate Items Remover, also known by the abbreviated name ODIR (you can download it here). As you see, all you need to do is choose a folder to check for duplicates and click the "Remove duplicate items" button. Besides mail, this tool can search for duplicated contacts, tasks, notes and calendar items. If to speak about shortcomings of this plugin, the main drawback is the lack of flexibility, i.e. lack of settings that would let you configure the search criteria. This add-in can look for duplicates within one Outlook folder only and cannot even search in subfolders of the same folder. So, if you are an organized person and have a multi-level structure of folders and you want to search for duplicates across all the folders, the ODIR add-in will be of very little help. While the first two (received and sent emails) do not raise any questions, you'd probably better not use this add-in to remove duplicates from the Drafts folder. If you actively use drafts in Outlook, for example to compose several versions of your reply when responding to a very important message, the ODIR add-in will recognize them as duplicates even if they have the same subject but different text in the message body. Regrettably, there is no free tool that would meet all the criteria in the heading, i.e. be flexible, reliable and quick. If you are looking for this kind of tool, check out Duplicate Email Remover, a time-tested solution from a trusted manufacturer of Outlook plug-ins (MAPILab) that has been working in this industry for many years. This add-in provides a handful of advanced options, which are not available in free tools and which let you search for duplicates in the folders you specify, with the priority you set, and based on the criteria you choose. 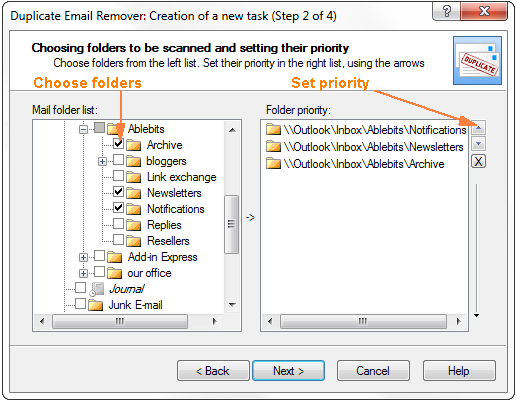 With Duplicate Email Remover you can choose the folders you'd like to check for duplicates and, most importantly, you can set the priority of folders. As you see in the screenshot above, you choose the folders to scan for duplicates on the left pane and set their priority on the right pane using the up and down arrows. If multiple copies of a particular message are present in all the folders you've chosen, the Duplicate Email Remover will leave only one message in the folder that comes first in the list (the Notification folder in our case) and remove duplicate e-mails from the other folders. If identical messages exist only in the 2nd and 3rd folders, the message will be left in the 2nd folder and deleted from the 3rd, and so on. A very handy option, isn't it? Another useful feature of the Duplicate Email Remover plugin is the ability to choose the action to be performed with duplicate e-mails. You can opt to delete them permanently, or move to the Deleted folder, mark with flag or mark as expired, copy or move to a specified folder. Apart from choosing the action, you can also specify the time period, i.e. apply the chosen action to email messages received within the last few days, weeks, months, or anytime. This is also a very useful option if your aim is to find duplicated messages with tiny differences, e.g. the sender name or date and time of sending. With Duplicate Email Remover you can handle these almost identical emails too. You simply choose the fields by which you want to compare mail items in a certain folder or folders, and then delete duplicate messages. For example, if you often receive multiple copies of the same message from the same person(s), uncheck a few irrelevant fields so that only one such email will remain in your inbox and all duplicates are gone. As you see in the screenshot above, three fields are predefined and cannot be unchecked. These are the main fields by which the Duplicate Remover detects duplicates: message body, subject and sender's email address. The others are up to you. Well, if you are interested to try Duplicate Email Remover, you can download an evaluation version here. This tools works with Outlook 2016, 2013, 2010, 2007, and 2003. Besides the two add-ins we've just discussed, there are tens of other duplicates remover tools, paid and free. If you have time and the desire to experiment, you can look through this catalog. You can get a much bigger list by searching in google, bing, or any other search engine. And finally, a little piece of advice, if you let me. When choosing the duplicate remover tool, make sure it is from a reliable and trustworthy vendor that has been on the market at least for a few years, Microsoft Partners and MVPs are given preference. You don't want some twopenny-halfpenny hack to bring havoc to your Outlook and eliminate a couple of important emails, do you? 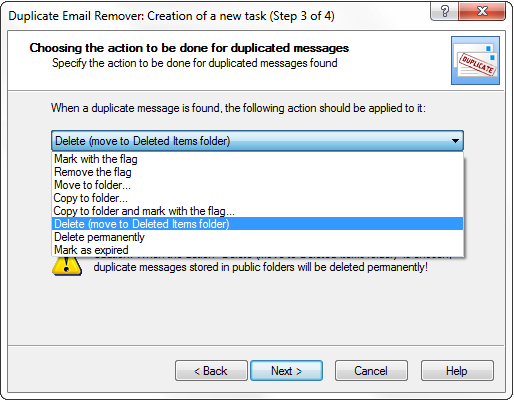 62 Responses to "How to remove duplicate emails in Outlook 2016 and 2013 quickly and safely"
* Keep option in Outlook saying " Leave copy of message on server" disable. This would prevent downloading of same email twice. 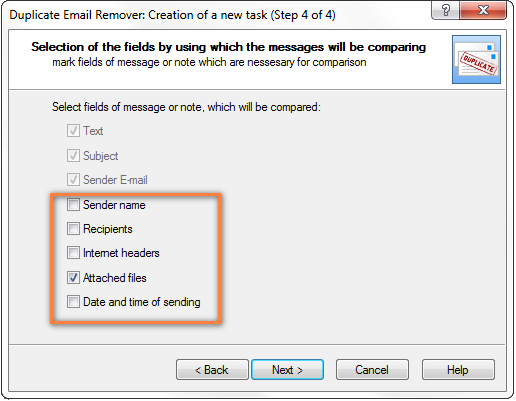 * Set of Rules in Outlook should be properly manage properly otherwise it would generate duplicate emails in Outlook. Already having duplicate emails in Outlook. Do not Fret out Use SysTools Email Duplicate Analyzer to remove repeated emails in batch across PST files. it will also remove emails from the server and store them with in your local PST . doing so means if the computer fails (hard drive) then you have no lost ALL of your email. I agree - This is why I always send an email that I send to somebody to myself also by placing my email into Bcc box also because if there is a fault a copy of my emails will also be saved on Virgin Media's Computer server also - It is easier to ask Virgin Media Technical Department to install my various accounts again and download my emails, especially after having to reinstall Microsoft's Operating System than to search for all the various emails' .pst files. Many Thanks, Your solution to remove duplicate emails is as pretty and beautiful as you. Hello svetlana can you help me in excell mater Plesae! Tell me if you are not mind it.. There is a way to do this without a tool and without worrying about folder structure. Export your email to a PST. Then manually delete the contents of those folders, and you can delete the sub-folders too, because they are in the backup. Once complete, you have NO dupes, AND a backup of your email to use in the future. This seems to be a very easy way indeed! I can see only one shortcoming. If you have some folder that contains very important emails or emails to follow up, and there are duplicates of those emails in other folders, the first found occurrence of an email will be left and all copies deleted. This means that a copy of the email may be deleted from the "Very important" or "Follow-up" folder. If you want to remove duplicate emails in Outlook 2010 and 2013, then you can take help of third party Kernel for Outlook Duplicates Remover tool which can quickly and safely remove all items of MS Outlook mailbox. Automatic method is more effective because it guarantees complete and effective removal of duplicate mails. Apparently a method of removing duplicates IS a built right into Outlook. Wow! This worked like a charm! Thank you! And thank you SC for your original post. This all fine, and I see that the problem has been going on for some time, but my problem is not duplicate emails; it's duplicate (or rather triplicate taske. If I delete even one of them, they all disappear. If this has been going on for so many years, why hasn't Microsoft fixe it yet??? At any rate, any help with triplicate task? Hi! On how many devices are you syncing the tasks? And, how exactly do you sync them? Thank you for this article Svetlana, it was exactly what I was looking for! As far as I know ODIR does not work in Outlook 2013. Am I missing something? You are absolutely right, ODIR works with Outlook 2010 32bit and earlier versions only. Duplicate Email Remover from MAPILab works with all versions including Outlook 2013 32 and 64 bit. This is a paid tool, though they have an evaluation version. Does anyone know of a duplicate email remover which works with Windows (7) Live Mail - and can search in multiple email sub-folders (below Inbox)? I found this tool. Personally, I have not tried it but the page states this Duplicate Remover works for Windows Live Mail. Hi, I'm using Outlook on my MacBook Air with Maverick OS. Do you know if there are tools I can use to remove duplicated emails with this configuration? I am very sorry but I do not know any Duplicate Remover tool that would work on Mac. We specialize in Windows only. can this work to remove duplicate contacts, or even contact that are already under delete items? The solution described in this article removes duplicate Outlook emails only. To delete duplicate contacts, check out this tool - Duplicates Remover for Outlook. It also works for duplicate tasks, calendars and other Outlook items. Be careful using ODIR. I noticed lateley that it is deleting email that has no duplicate. I don't know how many non-duplicate emails were removed from my archive. some deleted email are valid duplicates but some are not. Ouch! Thank you for the warning. I'm going to add a notice to the article for other users to know. Another free solution (and also doable for Mac users) is to use thunderbird and install the "remove duplicate emails (alternative)" plugin. It does a fabulous job. The only drawback is that you will have to re-download all your emails first into Thunderbird, before you can de-duplicate your mails. You can delete that thunderbird email account after de-duplication, however, which wiki give you all your drive space back. I like the article very much, it is self explanatory as well as very simple language used. Thank you for your kind words, Santosh! Does ODIR support Outlook 2010 Professional Plus on 64bits Windows 7 ? The ODIR add-in supports only the 32-bit version of Outlook 2010. How can I know the version of Outlook 32bit or 64bit ? Just click File > Help and you will see the version number (something like Version: 14.0.0000.0000 32-bit) under About Microsoft Outlook. Your article caught my attention and I downloaded the program ODIR. It installed without any problems and I can see the Add-Ins tab on the Outlook menu. When I select the tab and click on ODIR option and click on the dropdown list Remove duplicate items list... I get the following error message; "ODIR was unable to read your pst or ost file. Removing duplicate items is not possible." Is there anything I need to do to enable it to read the pst file? I am using Outlook 2010 and odir is something I have been looking for for quite some time. I would love to give it a try. This may happen if you are using Outlook 2010 64-bit because the ODIR add-in does not support 64-bits yet. If it's not the case, I think you'd better contact the ODIR support team for assistance. I'm using ODIR but my outlook file is already very large. Its about 19GB, and this often causes the ODIR to hang. Is there a better way to remove duplicates in such large files? I know I should have done it earlier ... but that didnt happen. I highly suggest DublicateFilesDeleter!It's a very usefull tool! Was struggeling with duplicate mails in Outlook 2007 for a long time. Since I only had that problem with 2 accounts from the same provider and not with another account from another provider, the problem had to lay there. So I removed my accounts from the first provider. After I reconfigured my accounts manually, the problem was solved. But instead of duplicating an account after I reconfigured the first account to save me some time with the second account, I manually configured the second account from the same provider as if it was a new account. So duplicating an account to easily duplicate the settings and then changing only the e-mailaddress and e-mail name, made Outlook 2007 believe that these were in fact not seperate e-mailaddresses but a duplicate e-mailaddress, even though I changed the e-mailaddress. Please update your article. It states that this works with Outlook 2013 while the developer of ODIR clearly states that it is NOT compatible with Outlook 2013. "One more serious limitation is that the Outlook Duplicate Items Remover does not support Outlook 2013 and Outlook 2010 64-bit yet." The other solution discussed in the article, Duplicate Email Remover, works with all Outlook versions, including Outlook 2013.
i agree this is confusing. you should have 2 sections... 1 for 2010 and 1 for 2013. a 'note' is not enough. I know what is the computer technical difference between; 32-bit and 64-bit - Therefore, the way I interpret it was that it didn't work for 64-bit operating systems. - It is possible to make 32-bit compatible with 64-bit but difficult to make 64-bit backwards compatible with 32-bit. - for example, if you had a vehicle with 32 people it is easy to fit them into a vehicle that holds 64 people but to fit 64 people in a vehicle with only 32 seats is more difficult. I forgot to say that the program was written to work with 32-bit and NOT 64-bit - It would have to be rewritten to work with 64-bit version because of the way it was written. - Some applications are written to work with BOTH 32-bit and 64-bit but this one was only written to be compatible with 32-bit. Does anybody know any tool that would AUTOMATE this? What I have seen so far, I think all of these tools still require manual work, even if it is just a couple of clicks. I want the duplicates to be moved to a spesific folder or deleted automatically, preferably every time I open outlook. It is a specific task. You’d better address this question to developers of the plug-ins for removing duplicates. There is more than a dozen of such add-ins, we’ve described only the most popular ones. Perhaps, you will find such an option in one of those add-ins. I don't think that there is one - It could have been worst. - The other PC's duplication applications (find duplications in any folders not just email folders) usually you have to manually decide which ones to keep and select which ones to delete - I think it is a security problem. - It isn't that simple to select an identical file (even though it looks simple), for example, group by; number of characters, dates, file names, and memory size, are just some things which make it complicated, which then raises the questions if I have to manually select virtually everything then what is the purpose of most duplications' applications? hi I am using outlook and we have received to multiple duplicate so I want to delete duplicate mai so kindly sujest me.. Thank you 4 Ur article on Outlook duplicate email remover..
Me need a support in free to remove all my outlook duplicate emails..
Hope U reply me soon..
Hv nice time n enjoy Ur life..
As already stated, use 'Clean Up' button in 'Delete' section of toolbar. It comes built in and I've used it to remove duplicates. I recently discovered the "Clean Up" feature in Outlook 2013 but it leaves 1000s of duplicated messages and I don't see any settings to change it to do any better so I would say to try it since it's built in and look at the results and go from there. In one folder it wouldn't delete any duplicate messages that had attachments. thanks for doing the article. Thank you very much. And if somebody want to delete duplicate file or simply find them then I recommend Dulpicate files deleter,it is very simple to use. But make it sure to keep the important files in back up. It is off topic but it will certainly help the people. Just use "DuplicateFilesDeleter".If you use this software you will be get comfortable. I tried that cleanup method available in outlook. It has options in setting. It clearly states that it will remove the duplicate items. There is also a way to select current folder only or folder and sub-folders. Very pleasant to see all this. But it does not remove any duplicate items. It does remove a number of important items from all folders but none of them are duplicates. I analysed a lot but the program behavior appears to be random. would you please introduce the operation in outlook2016? I download and install ODIR, but can not found the button or in COM. Title to delete duplicate emails but in "Problems created by duplicate email messages" then delete duplicate Contacts. For ordinary users, it is necessary to fix it basically without necessarily using the 3rd software to intervene. How do I run Outlook Duplicate Items Remover?